I grew up believing, “If you can read, you can cook.” That belief kept me going as a young bride and eager home hostess. A sad period of my life spanned a a decade, when finicky children, a grueling work schedule, critical in-laws, and my own stretch of problematic digestive issues had sufficient cumulative influence to make me abandon cooking altogether. Although I had previously enjoyed cooking for dinner parties at home, one particularly traumatic Thanksgiving was the last straw. I gave up on cooking. I probably went for five, maybe seven years without cooking much at all. And, when I did cook something, it didn’t taste very good. I came to realize two things about cooking. 1. The desire to cook is directly proportional to the appreciation of those for whom you are cooking. That includes cooking just for yourself. 2. Don’t serve it if you haven’t tasted it! In the past five years or so, I have become an enthusiastic cook once again. I have an appreciative partner who gobbles up whatever I prepare, expressing admiration and delight at every opportunity. Who wouldn’t want to cook for someone like that? 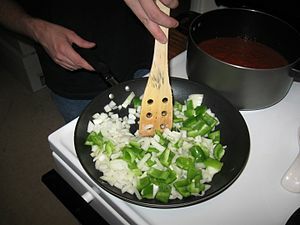 My Awareness Through Movement® students know I love to cook, for they frequently hear me say, “Pause. Taste the recipe!” Each movement exploration is full of interesting and unfamiliar variations. If you hurry through the lesson, adding movement after movement with no pauses for reflection and sensing, you have created the recipe for discomfort and confusion. Rather, after adding each new movement “ingredient,” students are encouraged to pause and discern. Add a little more next time if you like it, or use a little less when you continue. The student’s own learning through the lesson is tailored to his own abilities and “taste.” The new deliciousness in movement almost always leads people to want a second helping of the Feldenkraisian feast. Cooking for and with people who enjoy you, appreciate service, and who enjoy good food makes all the difference in the world! I am glad you have found your way back to playful experimentation in the kitchen.